Long unavailable in its original 145-minute release version, the Ingrid Bergman-starring Joan of Arc (1948) as religious epic falls less in line with later �50s and �60s big screen epics than the more intimate religious dramas of that period, movies like The Song of Bernadette (1943) and The Miracle of Our Lady of Fatima (1952). Produced independently for release through RKO, it was unusual, a personal project for Bergman, director Victor Fleming, producer Walter Wanger, and writer Maxwell Anderson, whose Broadway play (also starring Bergman), Joan of Lorraine, it adapts. It was an expensive, Technicolor production, $4.65 million, yet seemed as doomed as its heroine. Fleming, following a failed romance with his star, died of a heart attack mere weeks after the movie's premiere, which received mixed reviews, and its box office, still considerable, was damaged by Bergman's scandalous affair with Italian filmmaker Roberto Rossellini, while Joan of Arc was still in theaters. Seen it today, beautifully restored by the UCLA Film & Television Archive, the picture is genuinely gripping throughout, and Bergman and many others in the cast are excellent, and the screenplay is adult and admirably complex in the manner it explores the relationships of the Catholic Church with warring nations, and how Saint Joan's purity muddies their corrupt waters. And yet the film is also odd and clunky in other ways. Despite many impressive sets Joan of Arc is strangely claustrophobic, with soundstage exteriors dominating over location filming even when the latter is called for. The casting is odd at times, too. It's a bit disconcerting to see actors like Ward Bond as an ardent French disciple of Joan the Maid. The movie dispenses with the play-within-the-play device of Joan of Lorraine, in which a troupe of actors are effected in various ways playing Joan, her disciples and persecutors. 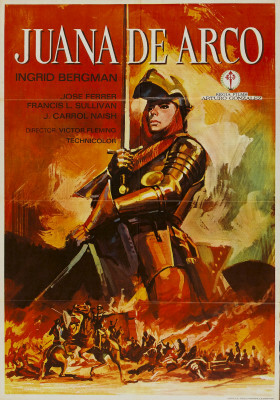 The movie instead opens with the teenaged Joan (Bergman), a simple farm maiden, after years of holy visions of St. Michael, St. Catherine, and St. Margaret, compelled to leave her family and lead France's decimated military to victory against the English and Burgundians so that the Dauphin (Jose Ferrer) can be crowned King of France. This, naturally, is met with skepticism, but after she confides to the Dauphin information known only to him and God, he agrees to allow Joan to lead the army in a hopeless siege on the Palace of Orleans. Although Joan is wounded, arrowed in the shoulder, she leads her men to a spectacular if bloody victory. The Dauphin is crowned King and Joan stands ready to lead the army into the last British stronghold, the City of Paris, but behind the scenes the Burgundians have secretly bribed the King into a truce for 100,000 crowns. Shocked by this sudden turnabout, she organizes her own army but is captured by the British and then sold to the Burgundian court of Count-Bishop of Beauvias (Francis L. Sullivan). Anxious to keep their fortunes intact, the English, Burgundians, and the French conspire to execute Joan as a heretic. Ingrid Bergman's passionate performance as Joan of Arc is the main draw. While it's a bit of stretch accepting Bergman, then in her early 30s, as 19-ish Joan, or the fact that even burning at the stake she still somehow manages to look stunningly beautiful, she nonetheless brings out all the conflicted emotions of the character. Joan doesn't pretend to fully comprehend her visions, ambiguously not depicted, nor can she fathom why she, a simple farm girl, was chosen. Her purity compels her to complete honesty and forthrightness, yet she feels uncomfortable with her growing admirers ask her to bless them, and horrified by the human cost on the battlefield, on both sides. One of the screenplay's more interesting components is how Joan herself, fearful of her mortal fate, unconsciously misinterprets visions promising her a final victory that, in the end, is actually a fiery martyrdom. Clumsily foreshadowed when she witnesses opponent Sir William Glasdale (Dennis Hoey, onetime Inspector Lestrade) burn to death, Anderson's script makes her deathly afraid of being burned alive. Anderson's play and screenplay, the latter co-credited to Andrew Solt (not the current documentarian), has curious views. Joan's nationalism and her belief that "God is on the side of France" jibe with American nationalism during this early phase of the Cold War. Conversely, the Catholic Church and officials from all parties are shown to be hopelessly duplicitous and corrupt, each far more interested in consolidating power and getting a cut of payoffs while brokering peace. In the Court of the Dauphin, later Charles VII, Ferrer's character is depicted as a frivolous dandy, borrowing money from his wealthy chief counselor, Georges de la Tremoille (Gene Lockhart). Once arrested, executing Joan becomes the expedient solution to the dismay of the various open-minded judges, some of whom denounce the proceedings at the own peril. The large cast is all over the place, with esteemed actors like Ferrer and Sullivan sharing scenes with others known mainly for low-budget Westerns and later sci-fi pictures. John Emery, a John Barrymore type, has a substantial role as the Duke of d'Alencon, but within a few years was supporting cheap pictures like Rocketship X-M and Kronos. Although Rand Brooks, playing Joan's older brother, had appeared in Gone With the Wind, he was known to audiences of the time as the juvenile lead in William Boyd's Hopalong Cassidy series. British character actor George Zucco had done mostly grade-Z horror movies of late, yet here has a wonderful little scene with Bergman, playing a local constable coyly aiding her in circumventing enemy troops nearby. A few actors, like Ward Bond, initially seem as out of their element as Bond's frequent co-star John Wayne was playing a Roman Centurion in The Greatest Story Ever Told but, by the end, Bond really sells his character and makes him acceptable and even touchingly believable. Kino's Blu-ray of Joan of Arc, restored by the UCLA Film & Television Archive, is generally excellent. The 3-strip Technicolor matrixes are frequently slightly misaligned, varying not so much from scene to scene as shot-to-shot, while there is so much footage where everything is perfectly aligned the image looks nearly perfect, especially the innumerable tight close-ups of Ingrid Bergman, uncannily radiant throughout. The DTS-HD Master Audio (mono) is adequate. Region "A" encoded with optional English subtitles. Somewhat surprisingly, no supplements to this disc at all, though much more than many other Kino titles it certainly calls for some. This reviewer, waiting decades to see Joan of Arc while at the same time dreading what he imagined to be a repressively stagey, even grueling experience, was pleasantly surprised. It's a captivating if flawed work, more complex than one might have imagined, and thus Highly Recommended.